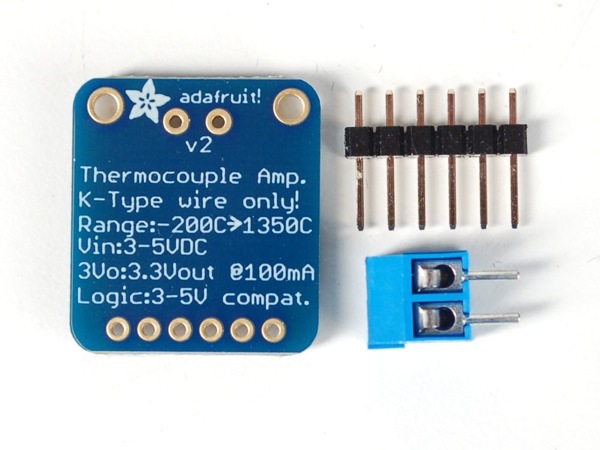 NEW PRODUCT – Thermocouple Amplifier MAX31855 breakout board (MAX6675 upgrade) [v2.0] « Adafruit Industries – Makers, hackers, artists, designers and engineers! NEW PRODUCT – Thermocouple Amplifier MAX31855 breakout board (MAX6675 upgrade) [v2.0]. Thermocouples are very sensitive, requiring a good amplifier with a cold-compensation reference. The MAX31855K does everything for you, and can be easily interfaced with any microcontroller, even one without an analog input. This breakout board has the chip itself, a 3.3V regulator with 10uF bypass capacitors and level shifting circuitry, all assembled and tested. Comes with a 2 pin terminal block (for connecting to the thermocouple) and pin header (to plug into any breadboard or perfboard). Goes great with our 1m K-type thermocouple. New! Now uses the MAX31855K instead of the MAX6675, so it can measure a wider temperature measurement range. Please note! 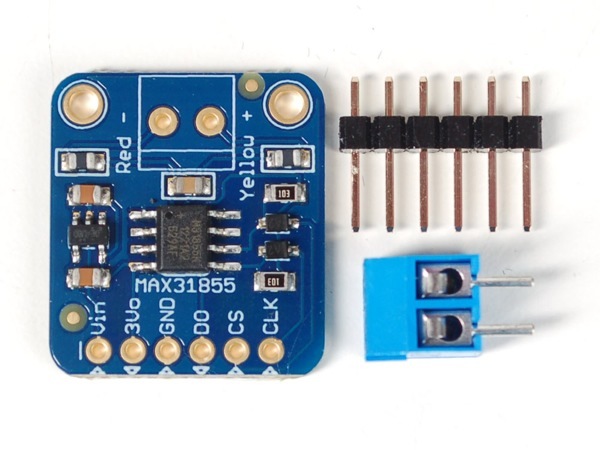 the MAX31855 is not pin compatible or drop-in code compatible with the MAX6675. We do have an Arduino library for both chips but you’ll need to adjust any existing MAX6675 designs for the mew MAX31855. The MAX6675 has been discontinued by Maxim. 3.3 to 5v power supply and logic level compliant! SPI data output requires any 3 digital I/O pins. Hey we even have a handy tutorial on thermocouples which includes an Arduino library, wiring diagrams and example code. How easy is that? I’m needing to measure 2 to 4 thermocouples for a BBQ controller. I’d rather not buy 4 breakout boards. Would it be possible to use a relay or something similar?